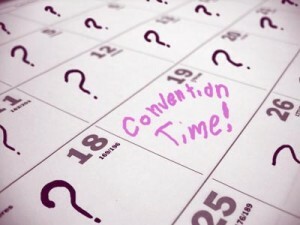 May is a big convention month, what with the Memorial Day Weekend holiday and all. It’s also a big steampunk convention month with both the tried-and-true and brand spankin’ new. As usual, here’s a sample of the fan conventions happening this month. My goal is to give a taste of what’s out there, not compile the compendium of cons to end all such. So, sing out on the events I’ve left off. If there’s nothing here to your taste, take a look for yourself using the resources in my Convention Lists & Calendar Sites article. Always remember, the internet is your convention research buddy. What: Unique comic convention focusing on bringing local comics professionals together with the community to promote literacy and comics as a profession. What: Gaming convention held by The Games Club of Maryland. What: Southern California’s first steampunk and Victoriana convention. What: Steampunk convention at the Charles River Museum of Industry & Innovation. What: One day anime marketplace. What: Science fiction and fantasy convention with an emphasis on art. What: Gaming event for developers to show off their video games to us players. What: Celebrating the radio shows and audo play tradition stretching from the ’20s to the ’70s. What: One of New England’s premier comic book conventions. What: Fantasy event celebrating Faeries. What: Furry convention. 2011′s theme is “Furries in Wonderland”. What: Comic con held in the Detroit suburb of Novi. What: Used to be mostly an exhibit hall but has expanded to include panels and cosplay contests. What: Pinball festival donating all proceeds to the Boys and Girls Club of Greater Sacramento. What: The newest place for pulp writers, artists and fans to come together. What: Japanese Animation, manga/comics, and culture convention run by college students. What: UFO and science fiction convention. What: Horror convention produced by Creation Entertainment. What: Comics and pop culture expo. What: Modeling (hobby and movie figures) convention. What: Chicago and the Midwest’s largest anime, manga and Japanese popular culture convention. What: Comics and art festival formally called Super-Con. What: Longest-running gaming convention in all Canada. What: Celebrating the classics of cult and drive-in cinema. What: They’ve moved to a new location this year; Irving Convention Center. What: Free admission! Celebration of comic book culture and its fans. What: Four days of peace, lobe, and boardgames. What: Video game convention for computer and video games and related products. What: Maker Faire is the world’s largest DIY festival. It has a strong steampunk spirit and it looms large on the calendar for the builders in the Bay Area’s steampunk communities. What: Comic con held at the Puerto Rico Convention Center. What: The Inland Northwest’s only comic convention. What: Comic convention held at the Minnisota State Fairgrounds. What: Three-day expedition into yesterday’s future. What: Maryland regional science fiction and fantasy convention. What: Fastest-growing comic convention in Houston. What: Utah’s longest-running, and largest, general science fiction and fantasy convention. What: Science fiction and fantasy convention. What: The largest horror convention in the Pacific Northwest. What: LAN party and gaming event. What: Game convention run by Startegicon. What: Game convention billed as The Khan of Cons. What: Self-proclaimed definitive gathering of SF/Media fandom. 2011 theme is “31 Flavors of Fandom”. What: Montana’s premier science fiction convention. What: Historical miniatures gaming convention. What: Board game play test convention. What: Doctor Who, Stargate, and everything in between convention celebrating science fiction. What: Premier steampunk event of the Midwest. Great article! The Big Wow was a small show, at least on Saturday. I did not see a lot of attendees at all. The guysts were great and making a go of it, but Kathy Garver packed up at 3PM. Poor Richard Kiel was falling asleep at his table! James Bond would not like that at all I’m sure. Denise Crosby did screen her Trekkies I film on Saturday but then after the viewing she “had to eat” and never came back. It was announced “she will be at her table to answer questions” but it was a bit rude not to show up back at the event and take questions there. There were only 11 or 20 fans watching. Such a small turnout! Comics: Tons of bargains due to the low turnout. 50% off everything so early in the game. I did enjoy the independent artists that came out and meeting Steve Englehart who was hawking his new books. Frank Cho’s drawing class was great to see, with video of his drawing a foxy Ms. Marvel model. The costume contest was tough getting off the ground for the crew, from my observation. The guy who was to handle it was not around until just before 6. There were 11 enthusiastic contestants but there were only 20 or so viewers and photographers. Before you think me overcritical, I do remember SuperCon 2009 and though it was a smaller space there were a lot more attendees. The organizers placed the convention just before the new week’s Fanime, coming to San Jose Memorial Day Weekend. I highly recommend the Big Wow show, but the organizers would need to survey their audience — what is the best date for the show? I’ve been to large shows and small hotel lobbies in the last 25 years and though this show had a lot going for it, the number of attendees was lacking. Let’s hope 2012 is better. Frank Cho announced he is coming back with Adam Hughes.